The kyoketsu-shoge is one of the intriguing cold weapons that mean «to jump and frisk in the fields and mountains». This is a specific double edged stiletto of the Ninja espionage kit with two blades, one of which is the straight and double edged and another one is kinked. To the haft of the kyoketsu-shoge a long, thin, durable and light rope is attached, made from female or horse hair, with a large metal loop or a ring at the end. A kyoketsu-shoge is the weapon to be applied by the Ninja warriors for various missions they perform. This weapon is used as a stiletto with the curved blade to get hold of the opponent’s sword to drag away in the twist. The kyoketsu-shoge can be used as a missile weapon, and a grappling hook. When used in rotation at a one and a half to two meters distance the kyoketsu-shoge could stand against the spear and a battle-axe with the equal combat capacity. 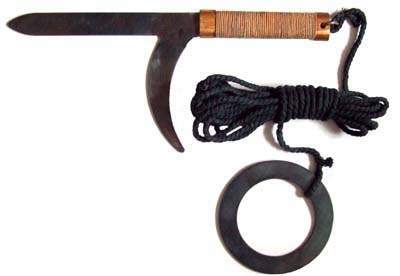 This weapon would use by Ninjas to climb mountains using the hook and the rope was useful to climb up or get down quietly. The rope of the kyoketsu-shoge was also applied as a lasso or a strangler. While passing over the steeps, gulfs and Mountain Rivers with the rapid flow, the weapon is often used for safe and sound getting the destination. While doing that, the hook is draught to the other side of the steep and a solid branch of tree is good to fix the metal ring for stability.